Charlie was pacing around the archive office a little while ago. Something was bothering him, and I wanted to make him feel better. But I didn't know what was going on. Then this well-dressed woman came into the office, carrying some bags with old books in them. Turns out she's the mayor of Athena -- whatever that means -- and she wants Charlie to look at these old books she brought. Charlie is always looking at old books. He seems to get excited when he has new ones to play with. These books are what you'd call pretty old, I'd guess. They date from something called the Civil War. That was a long, long time ago, from what I can tell. This mayor woman just told Charlie that what's in these old books could affect an election. I think that means choosing someone to do something. In this case, it's her son who wants to get chosen to be in the state senate. 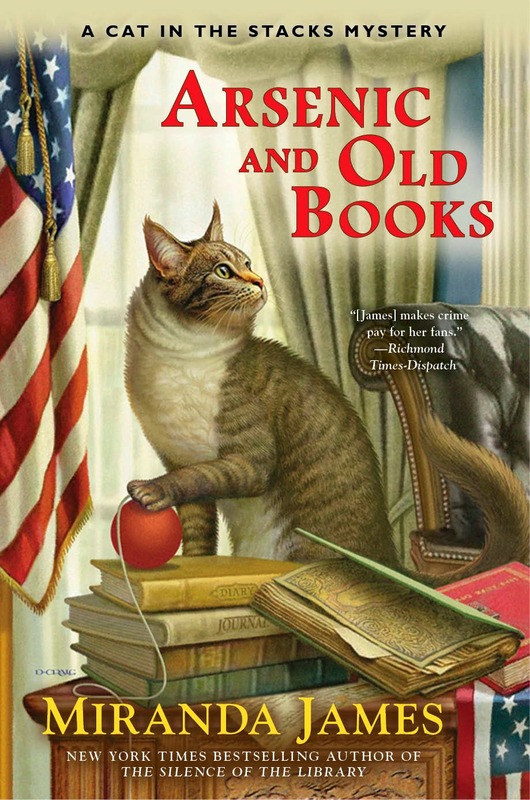 Arsenic and Old Books, the sixth book in the "Cat in the Stacks" series goes on sale Tuesday, January 27th. This will be the first hardback original in the series, and it contains some bonus material -- a short story entitled "When Charlie Met Diesel." I can't wait for this new book! Diesel and Charlie are two of my favorite cozy characters, and it's always so much fun to see what they are up to. I enjoyed Bless Her Dead Little Heart a lot, and think it will also be a great series, but Arsenic and Old Books is the one I'm really waiting for. I'm a librarian myself, although my old cranky cat Samantha is somewhat less sociable than Diesel. I'm glad to know that the book includes a short story too. Can't wait to learn more about those old books! I'm actually reading the second in the series right now (my first exposure to Charlie and Diesel) and I'm enjoying it. I love the relationship between human and cat and the love Charlie has for books! Looking forward to reading more from this series - and even back tracking to the first book! Love this series. Diesel is such a cool cat. Everyone love him. I can't wait.